It's been a while since I've opened something that I haven't done before on Retail Review, so that's why I'm excited to bust this 13/14 Titanium tin that I recently ordered online. These tins may be more readily available in cities and places where hockey is more popular, but here in sunny Sacramento, Ca... these types of higher end retail hockey products are extremely difficult to find. I've always heard about retail tins, but this might be my first time opening one. I've definitely never gotten Titanium before in this form. I tried a box of the hobby version of Titanium earlier this year, and it was good. I'm really happy that I can now try it in this form. I appreciate that Panini has inserted retail exclusive content with these tins so that they have some chase and value to serious collectors. The back states that there are a variety of things that can be found within the tins - from memorabilia card to autographs. Titanium was known for being a strong rookie card product, so I'm sure that will be a main point of emphasis when I bust this tin open. I really enjoyed opening up the Titanium tin. The packaging was actually something that made the opening experience more fun. I felt that it wasn't just a 'cheaper' retail product, but something that true people of the hobby would like to have. The tin format reminds me a lot of the one-pack-per-box higher end cards like Limited and even The Cup. Of course, it doesn't have the premium quality of those cards, but the packaging has some parallels. Unlike the hobby version of Titanium, the retail version is not on foil board... and I think that's fine. For player collectors, they will have to track down both versions of the base card. At 30 cards per tin, it was the perfect amount to insert and give to the buyer. 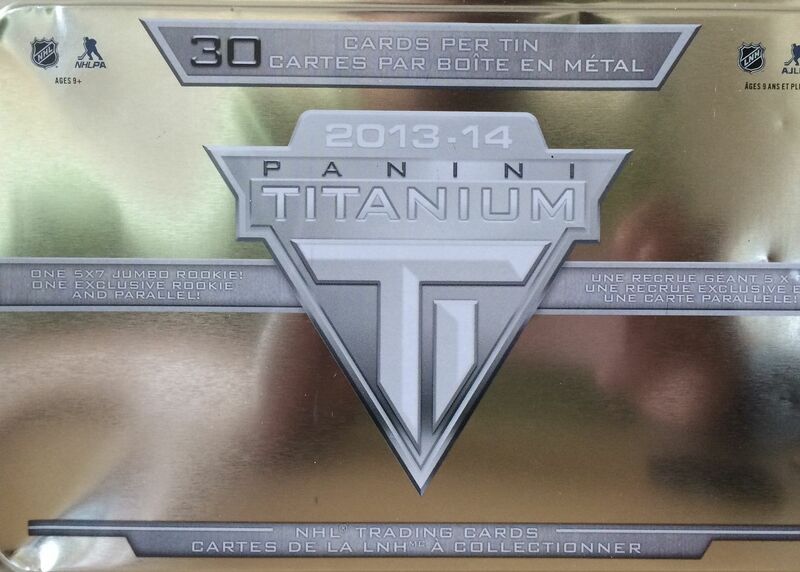 This Titanium tin was a great idea by Panini. Hopefully Upper Deck will think of retail products in a similar fashion next season. One of the really unique items in this tin was an oversized rookie card of Dougie Hamilton. Panini and Upper Deck have done these very large cards on occasion, and I'm not the biggest fan of them (because they are hard to store). But it's still a cool concept and a nice addition to a retail product. It's always awesome to get numbered cards in retail. 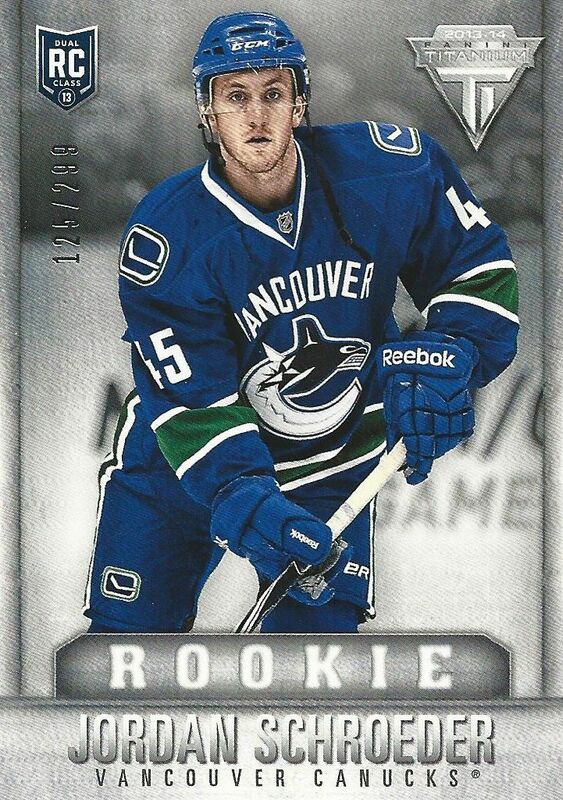 Titanium has always been known for their rookie cards, so getting Titanium rookies is always good. 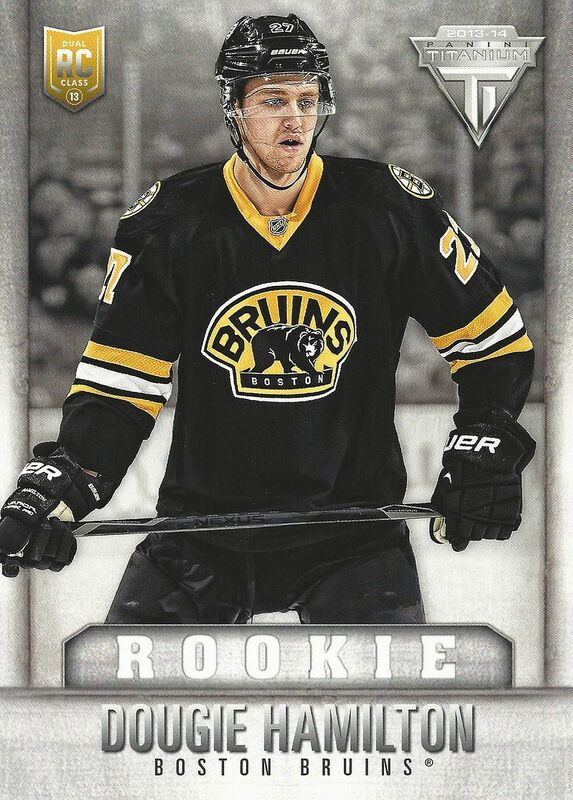 The retail version of the rookies are sure to be popular for collectors looking for a complete rookie rainbow. 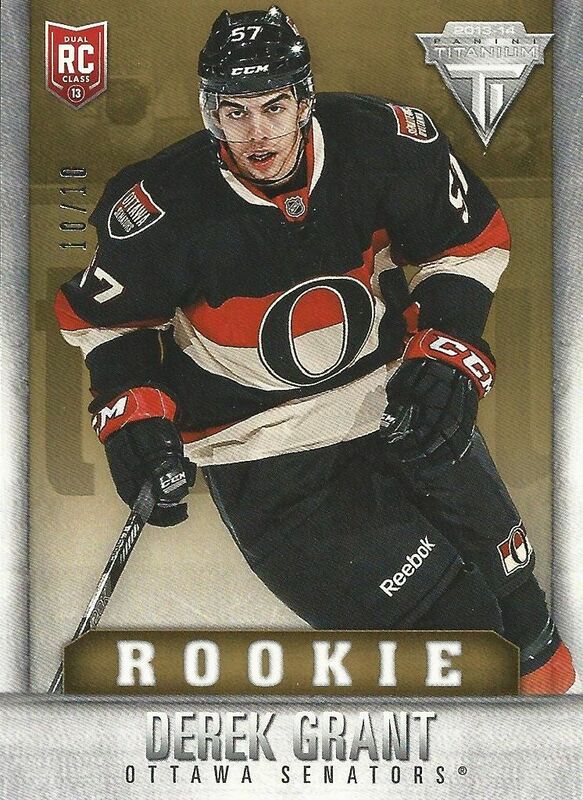 I'm not familiar with Derek Grant at all... but wow, this card is numbered to just 10! I was shocked to see such a low numbered card come out of this tin. This low of a print is always fun to find in retail. I was able to snag this little gem for under $12 at dacardworld.com. It's a great deal and a fun break for all collectors. I'm pretty sure they will go quick as the deal is a great one. I would definitely enjoy opening up more of these if I get the chance to do so. Kudos to Panini for releasing and designing a retail product that is strong, unique, and very collectible!